Milan is universally recognized as the economic capital of Italy, but it is also a city of art. Historical buildings, villas, monuments, modern-architectural buildings, churches and abbeys all offer a variety of styles and striking details that are well worth getting to know. 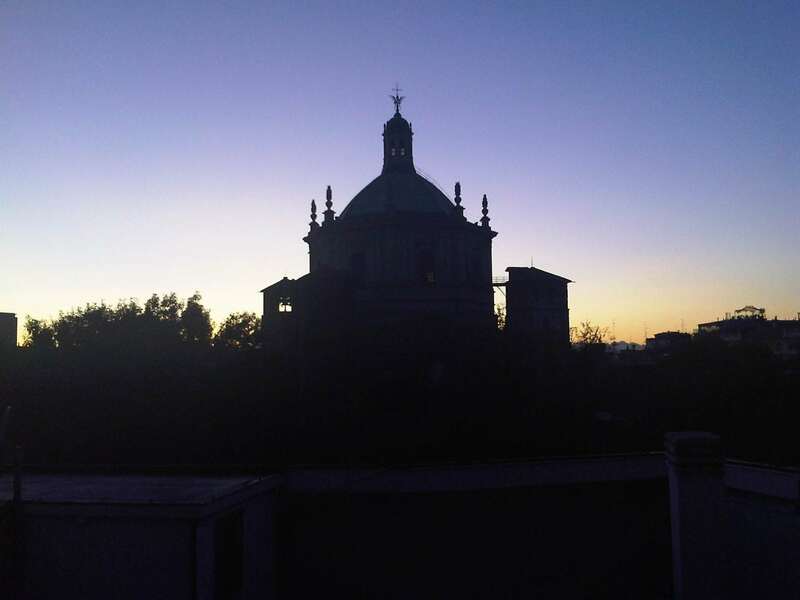 Yes, there are the well known clichés: il Duomo, La Scala, La Galleria, Santa Maria delle Grazie (feturing Leonardo’s last supper…), Sant’Ambrogio, the Castello Sforzesco. But the truth is that there’s much more than that. Milan can reveal fabulous treasures from its twenty centuries history, if only you take your time to look for them carefully, since most of them are very well hidden. 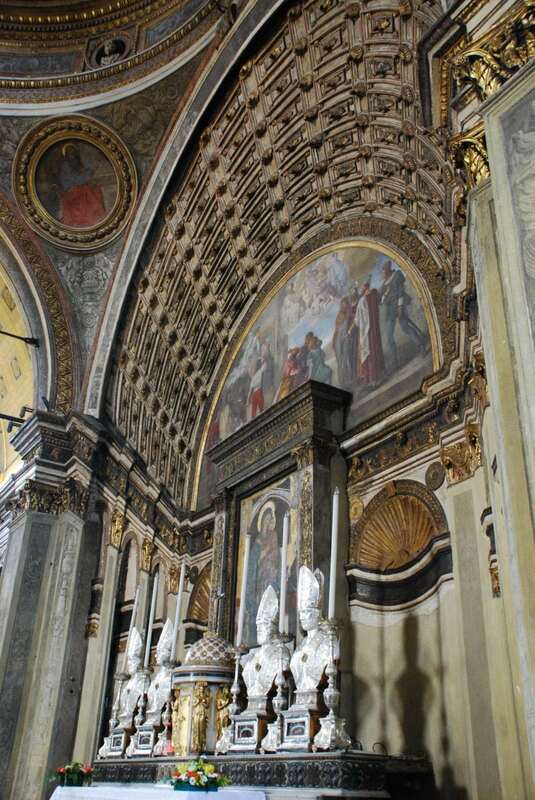 In this post I would like to walk you through fantastic renaissance churches, some of which date back from the end of the Roman empire: after all, Milan was the town where Constantine issued the edict legalizing Christian worship in 313. Let’s start from San Maurizio, located in Corso Magenta, 15. 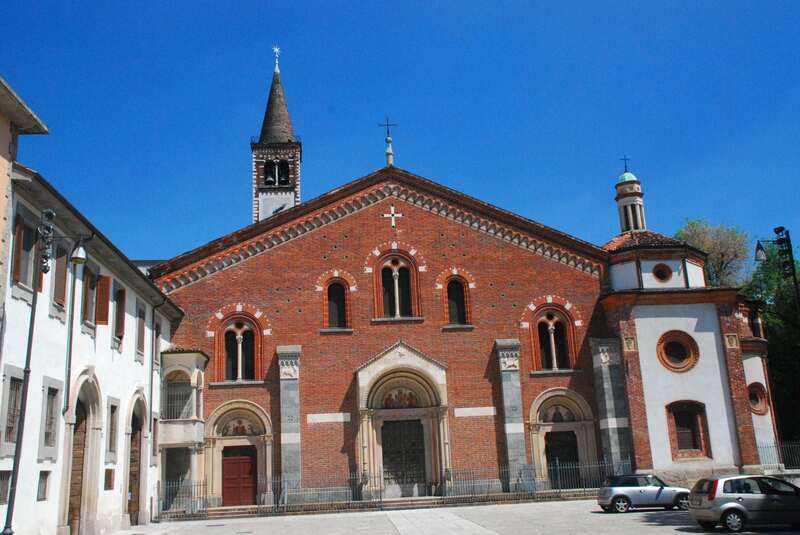 It’s close to Sant’Ambrogio, so you can go there after visiting it. 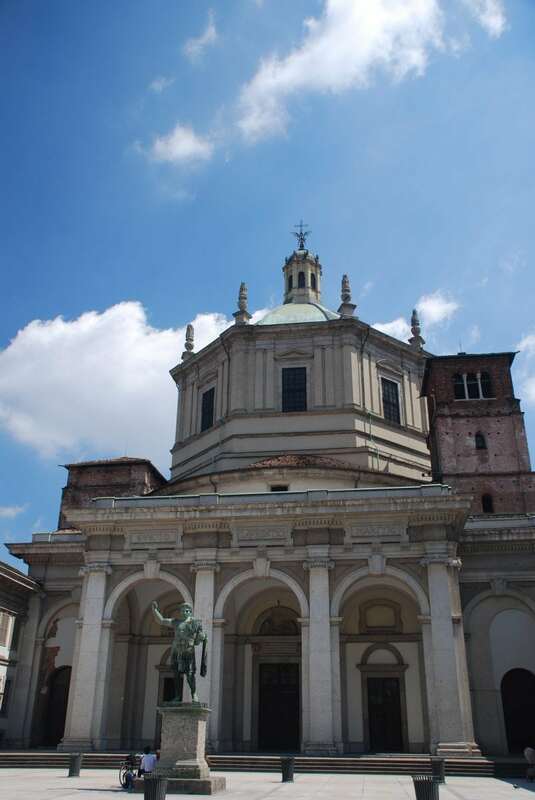 The church of San Maurizio and its adjoining cloister (now Milan archeological museum) are all the remains of the Monastero Maggiore, the oldest and largest female convent in the city, built between the 8th and 9th centuries close to the walls and near the Roman circus. The present church, begun in 1503 on the site of an earlier place of worship, has a single nave and is divided into two distinct areas by a screen extending up to the large rib-vault ceiling. The first hall, entered from the street, was where the faithful gathered. 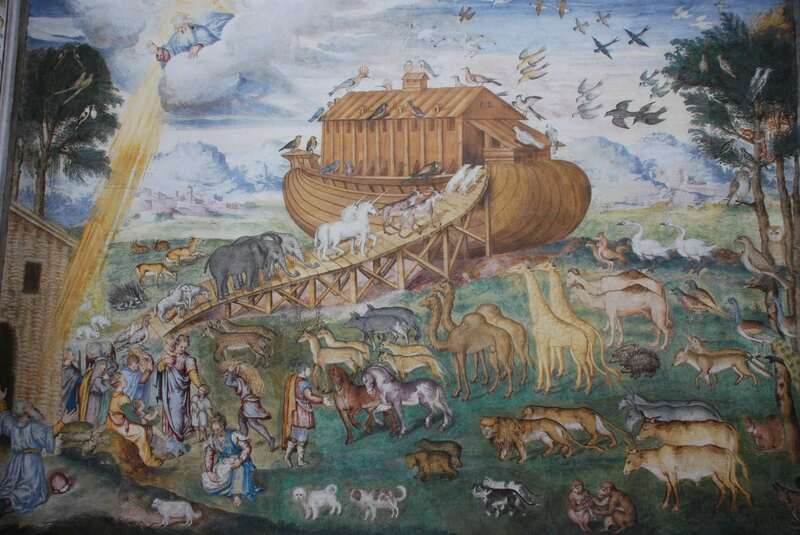 The second, connected to the rest of the convent, was reserved to the nuns. Nuns couldn’t get in touch with male attendance, not even the priest. To take the holy communion, the host had to be given through a hole in the screen (look at the photo). Along the side walls are ten barrel vaulted chapels over which is an elegant matroneum with Serlian motif. 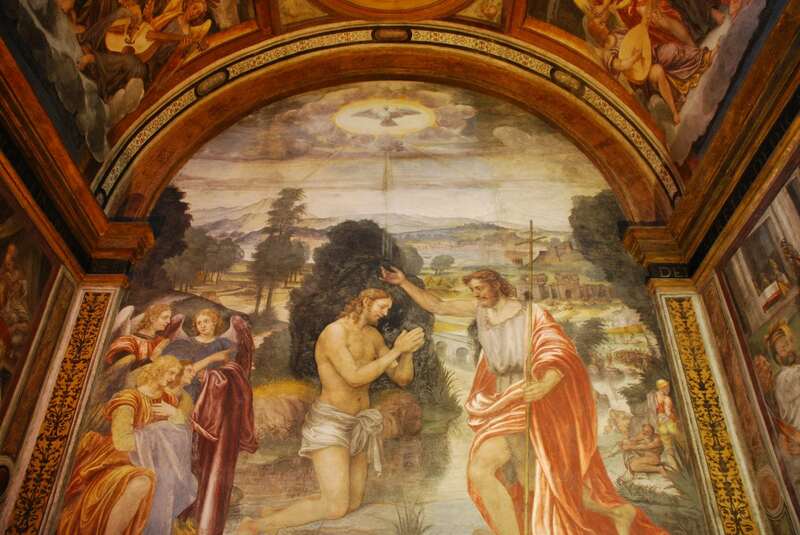 The walls are decorated with one of the most important fresco cycles from the 16th century Lombardy, mainly by Bernardino Luini and his followers. After this fascinating visit to a temple of the faith, what about having a look to a modern Gourmet temple ? 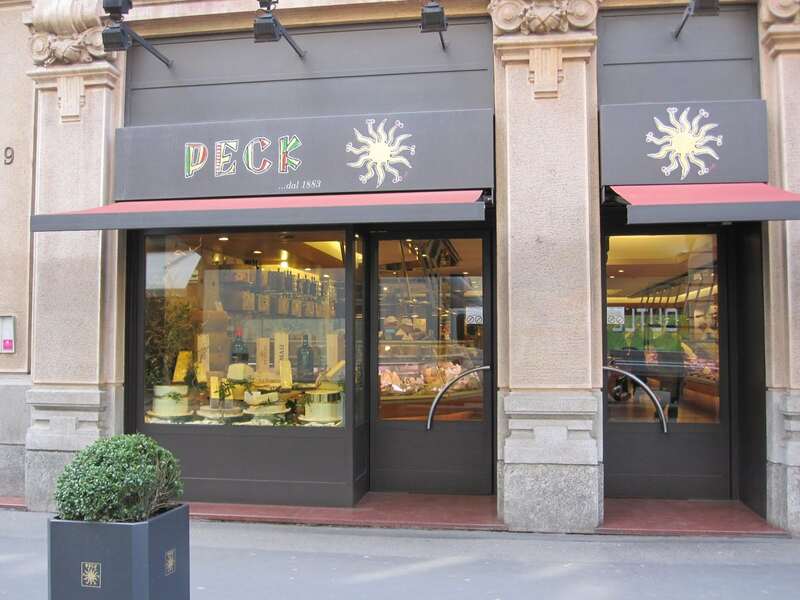 At walking distance from San Maurizio, in Via Spadari (very close to Piazza del Duomo) you will find Peck, by far the most reputed Italian Gourmet shop, often referred to as the “Italian Fauchon”. On your way, stop in Piazza Affari, where the controversial L.O.V.E. statue from Italian artist Maurizio Cattelan faces the Milan Stock exchange building. L.O.V. E. stays for di Libertà (Freedom), Odio (Hate), Vendetta (Revenge), Eternità (Eternity). A few hundreds meters away, Peck delicacies are waiting for you. 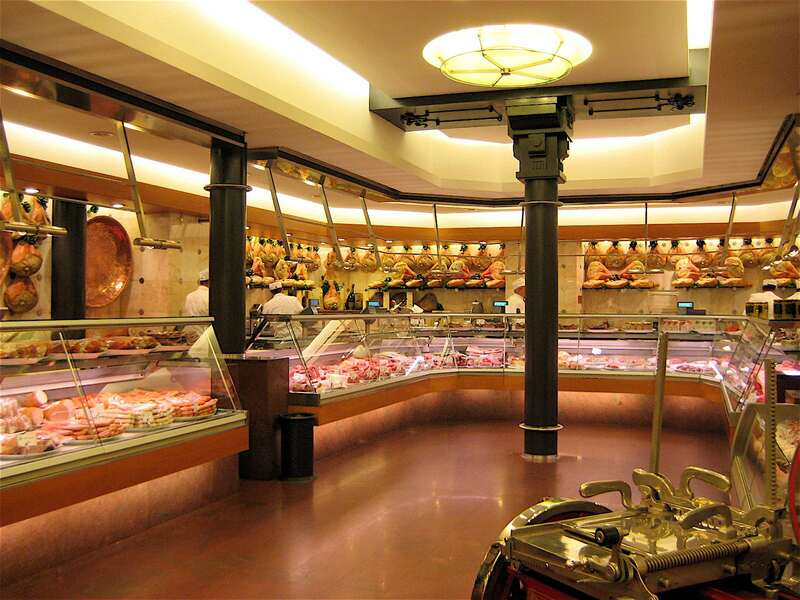 Here you will find an incredibly wide range of culinary products, all at he utmost level of quality and desirability: gourmet meats, cheeses, meats, grill, delicatessen,pasta, pastry, ice cream, bakery and the most tasty may want the gourmands around the world. 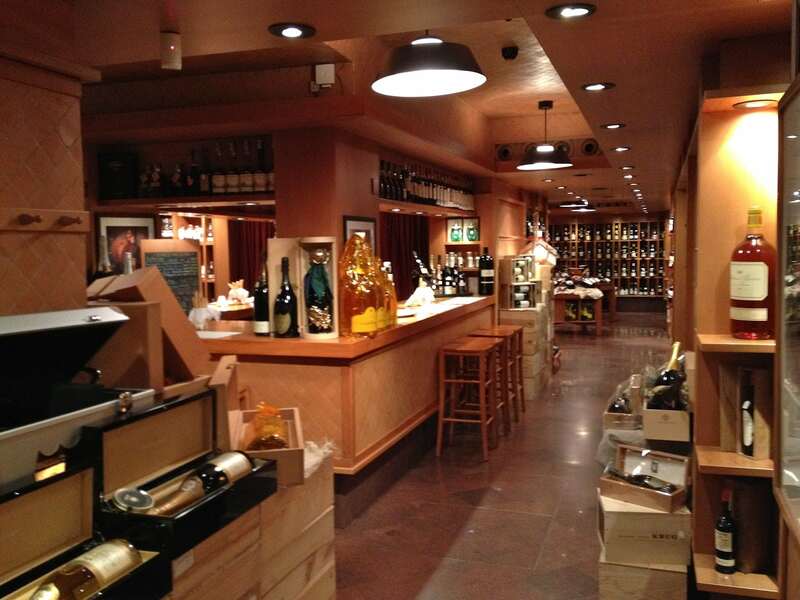 Peck basement hosts one of the most famous and prestigious Italian wine shops. Here you will find the most prestigious Italian and international wines, in a classy and refined setting. It is also a perfect place for an exclusive Aperitivo. 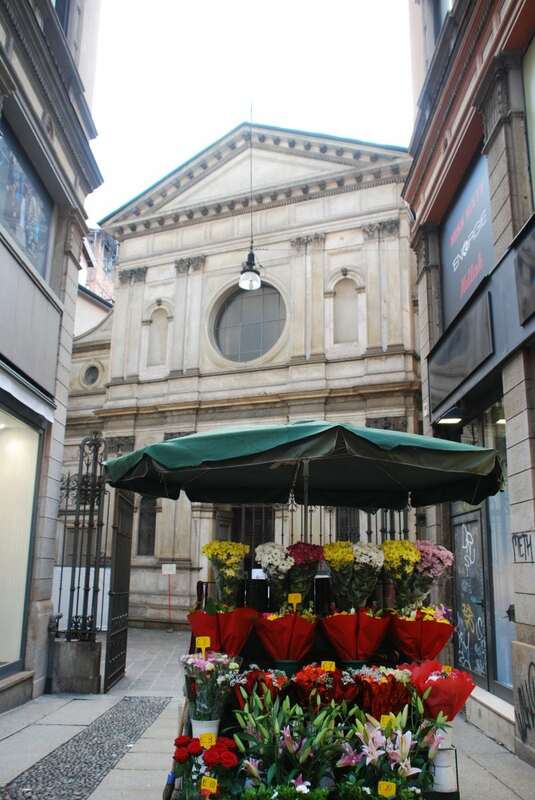 Back to culture and history, just in front of via Spadari, in Via Torino, nearly unnoticeable, you will find the Chiesa Santa Maria Presso di San Satiro (commonly known just as San Satiro). The is a delightful church just south of the Duomo in Milan, and one of my favorites. 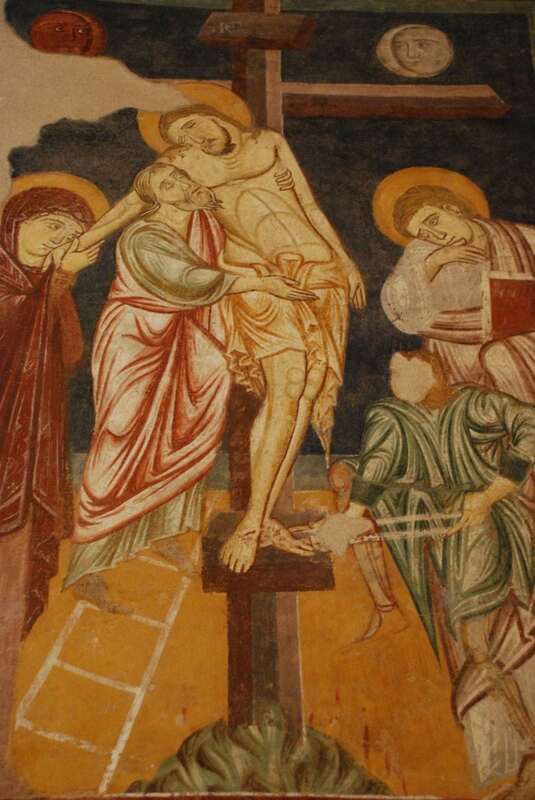 While San Satiro is now eclipsed by more famous Milan churches, it was an important pilgrimage site in the 13th and 14th centuries, after news spread through Christendom that an image of the Madonna here shed real blood when stabbed. 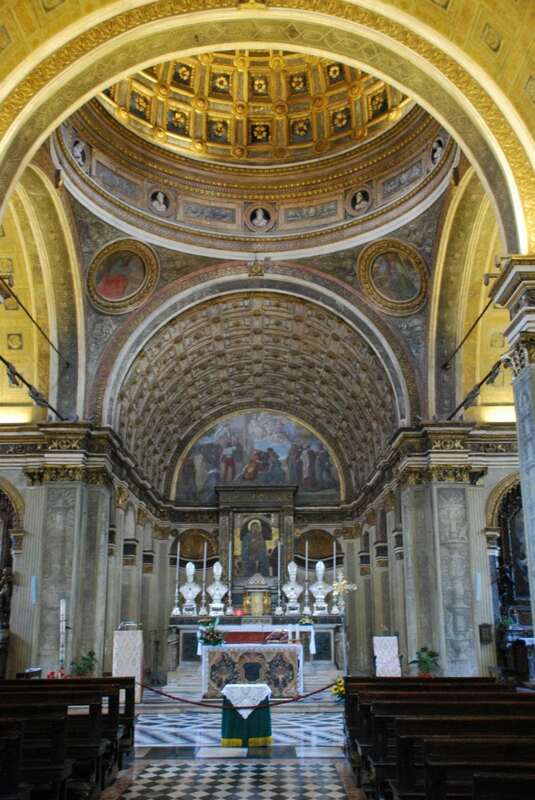 An architectural gem, San Satiro was later perfected by Bramante (1444-1514), demonstrating his command of proportion and perspective, keynotes of Renaissance architecture. 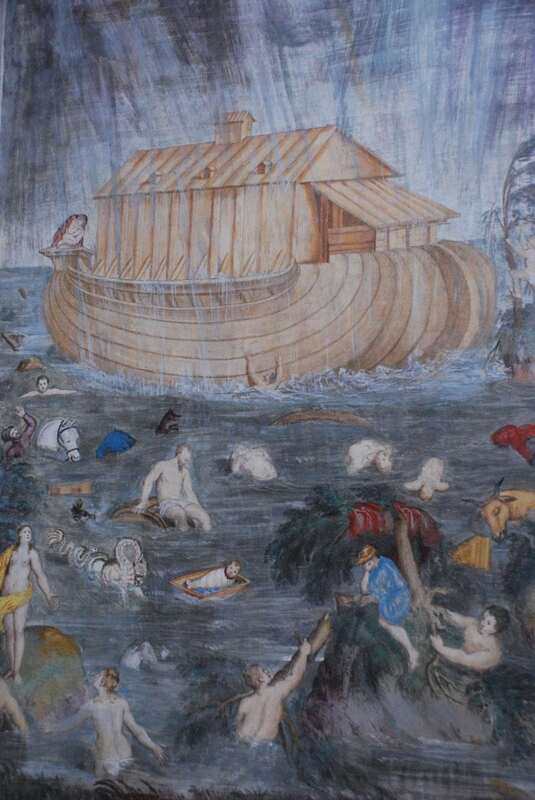 In 1472 Duke Galeazzo Maria Sforza of Milan commissioned the extention of the chuch. His ambitions were great but the location available to him was limited by the presence of a busy street. The choir, the space behind the altar, had to be truncated, making the church awkwardly short. 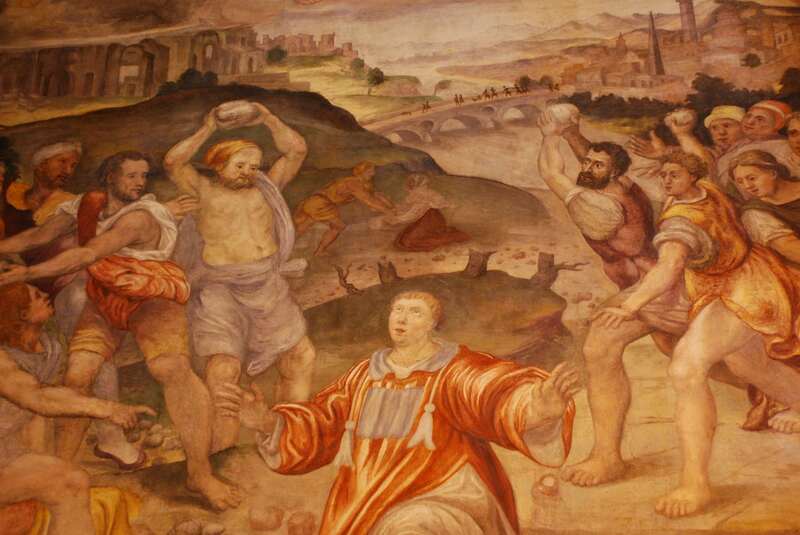 Undeterred by such an obstacle, Bramante devised an ingenious solution. 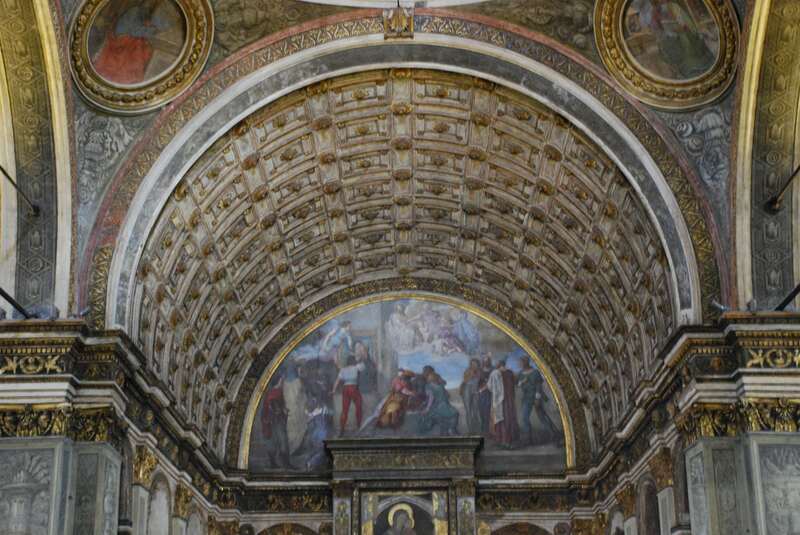 He painted an optical illusion.Trompe-l’œil, or architectural optical illusion was popular in late renaissance and baroque, but Bramante took the visual deception to an entirely new level. Standing at the entrance of the edifice one has an impression of a much deeper space, extending further behind the altar than is physically possible. The illusion, of course, quickly disappears as one steps aside from the main axis of the church. 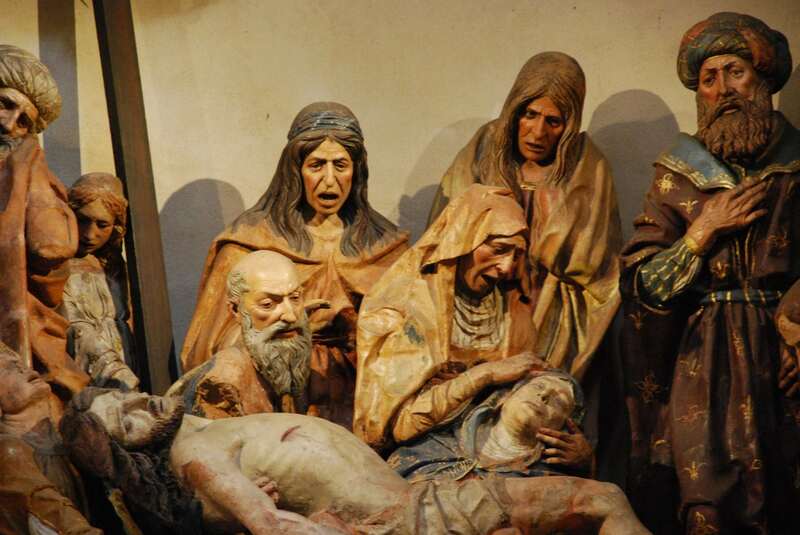 Another gem lies to the rear of the left transept: the Cappella della Pietà, so called for the 15th-century terra-cotta Pietà it now houses. 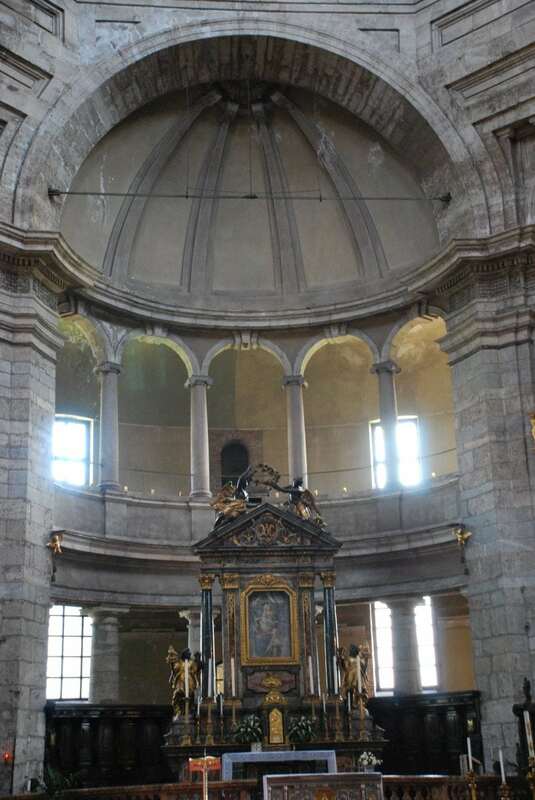 It was originally built in the 9th century to honor Saint Satiro, brother of Saint Ambrose. 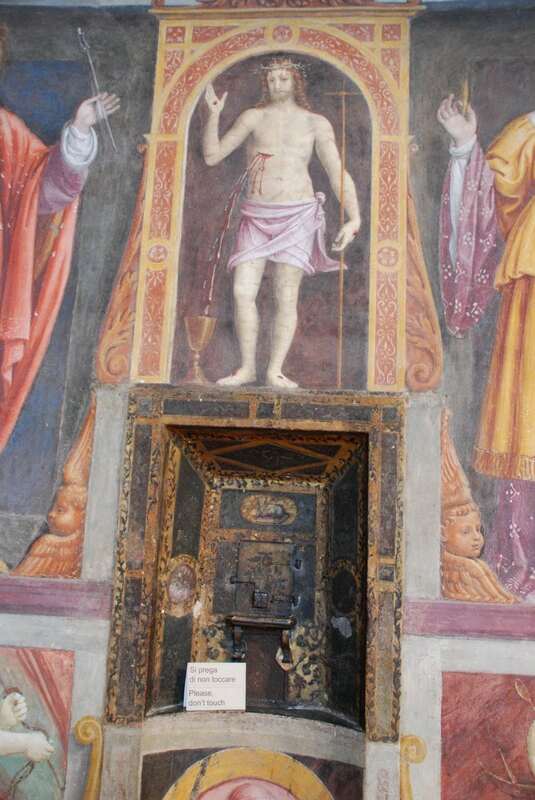 Even more attractive than the namesake statue, though, are the Byzantine frescoes and Romanesque columns of the chapel. Getting out San Satiro, keep on walking south in Via Torino. 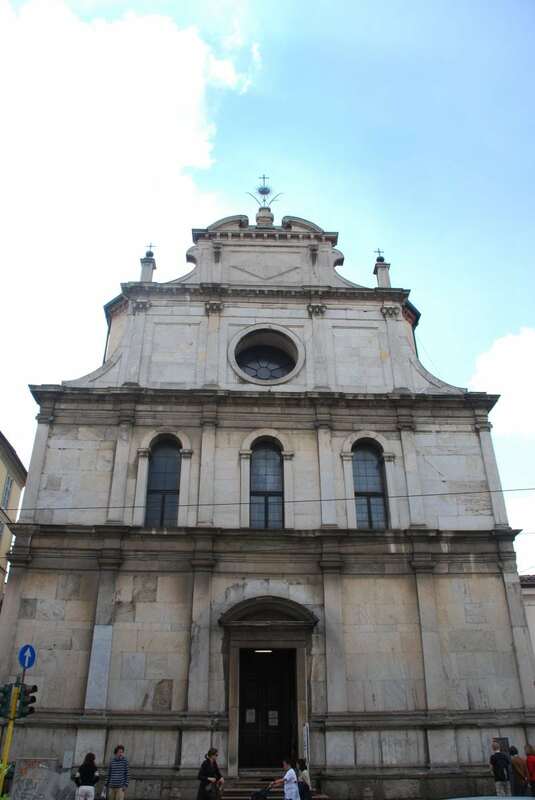 Once arrived at the large crossing with Corso di Porta Ticinese, turn left towards San Lorenzo Church. 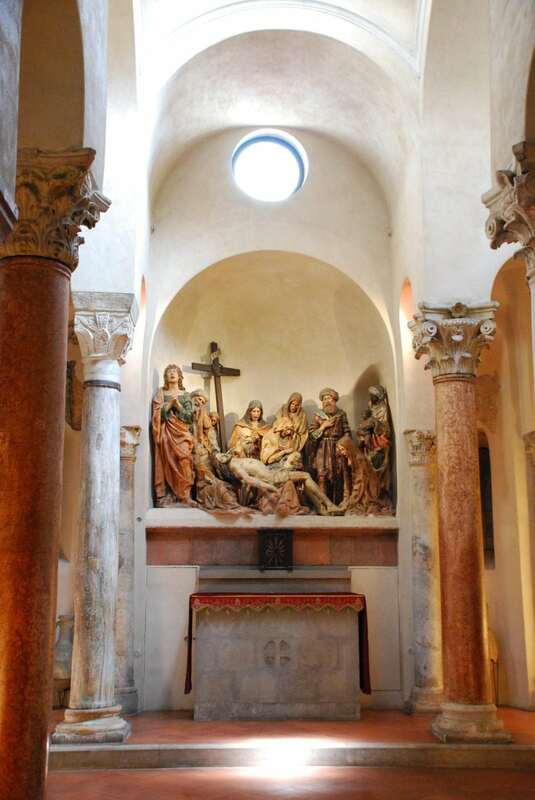 Dating from the 4th century AD, the Chiesa di San Lorenzo Maggiore is the oldest church in Milan. 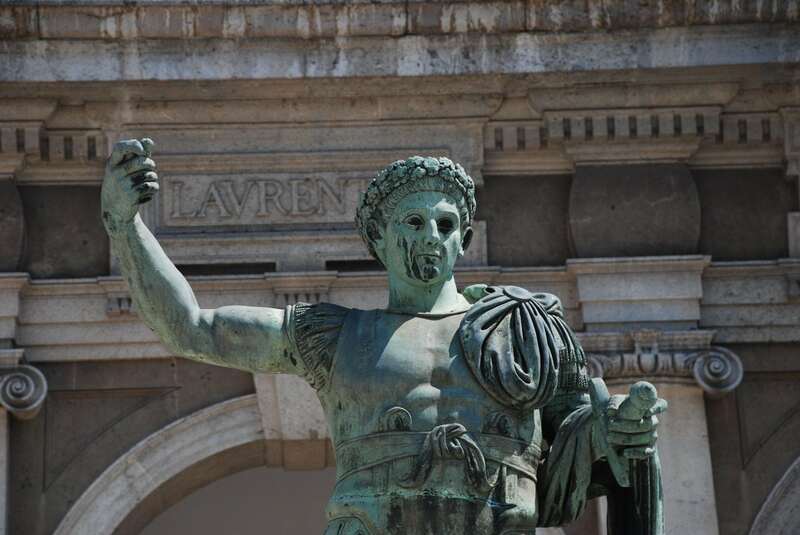 With ancient architecture that might seem more at home in Ravenna, San Lorenzo recalls the days when Milan was the capital of the Western Roman Empire. Probably at the beginning of the V century a.C., on occasion of the building of the basilica, the columns of a big building of the II century a.C. from another part of the city were dismantled and reused in the construction of a wide quadrangular hall opposite to the Basilica. 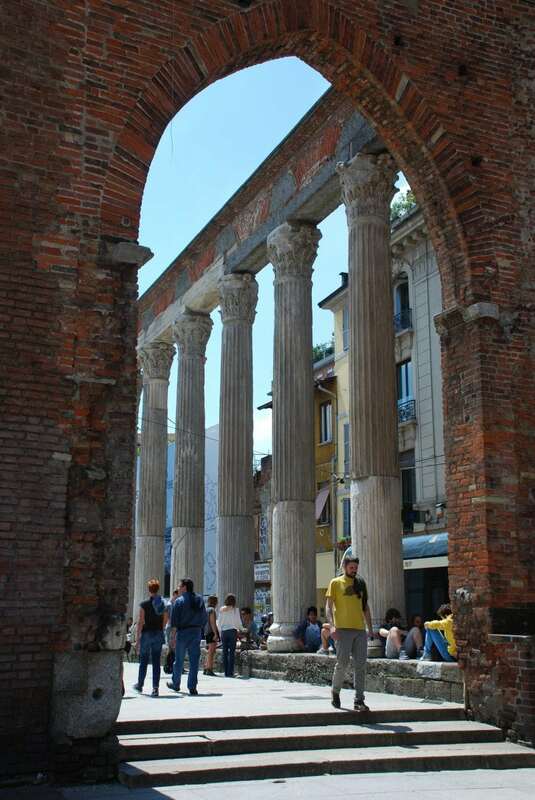 At present, the columns are all that remains of the monumental hall front, and their aspect is the result of several interventions through time, from the Middle Ages on. The Colonne di San Lorenzo are a popular meeting point, especially for the student population. 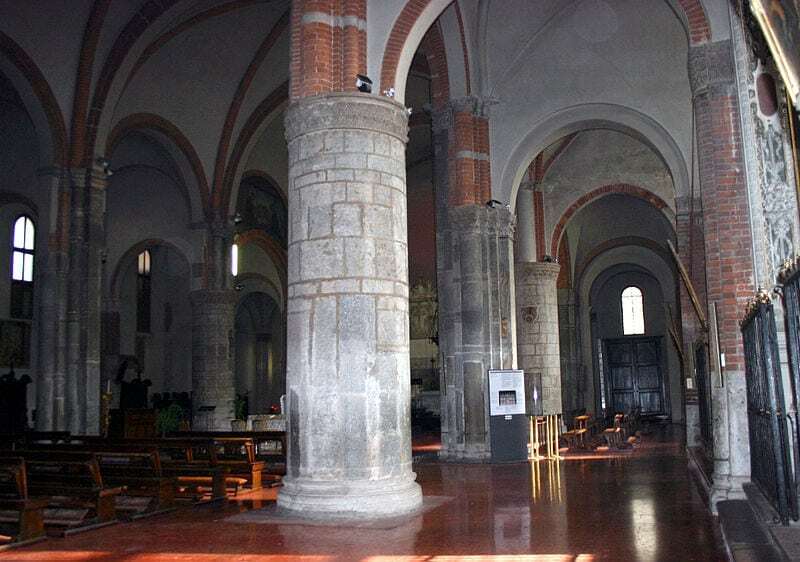 Unlike the majority of the Paleochristian churches, the interior of San Lorenzo has a central ground plan, which is not surprising, considering that the basilica was erected as Arian church and that only later on S. Ambrogio succeeded in acquiring it from the ecclesiastic properties of Milan. It is composed of a wide octagonal room with two orders of arcades, overtopped by the magnificent cupola. In presence of the keeper it is also possible to visit the southern sacellum of the basilica, today S. Aquilino’s Chapel, holding the remnants of mosaics which once must have decorated the whole place, not inferior in opulence and beauty to the Roman-Byzantine mosaics of Ravenna. However, the most suggestive view of the Basilica can be appreciated from Piazza della Vetra, where it is possible to observe the whole apsidal complex, marked by the three Saint’s chapels. 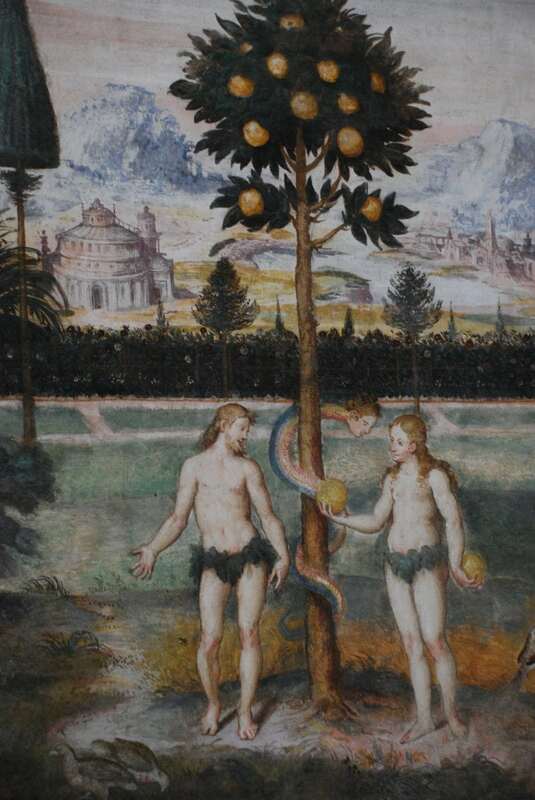 By the way, Piazza Vetra used to be one of the darkest spots of ancient Milan: this was the place chosen by the inquisition to publicly torture and burn alleged witches. Now cross via Molino delle Armi and keep on walking in the nice Giardini di Piazza Vetra garden. 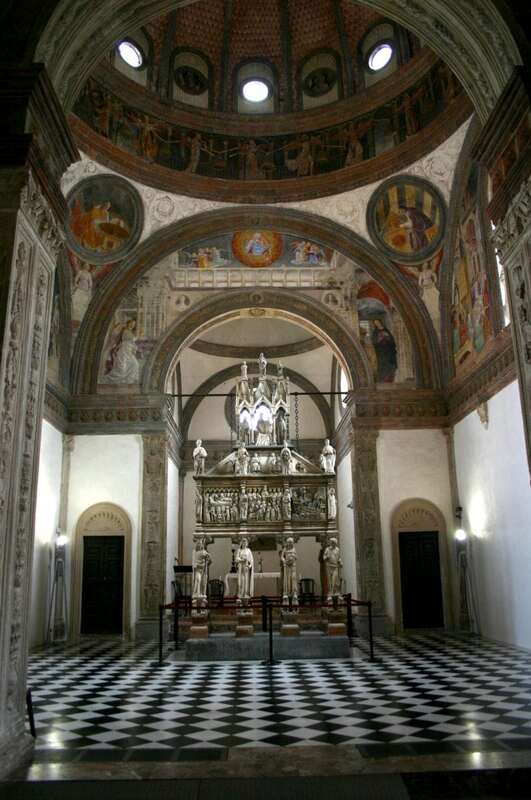 After a few minutes you will spot the last monument of this tour: the church of Sant’Eustorgio. The Basilica’s architectural structure is particularly complex. The interior has three naves. To the basic Romanesque building, many chapels were added over the centuries following the church’s foundation, above all on its right-hand side. 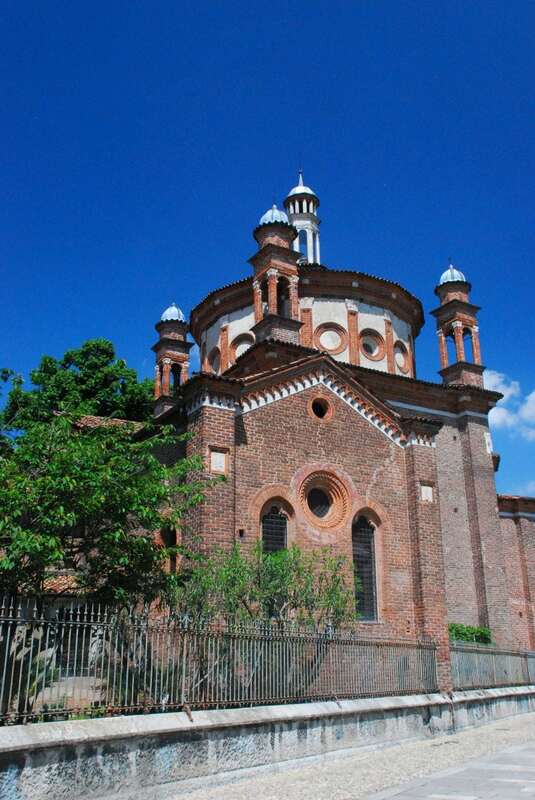 This is one of the oldest churches in Milan. 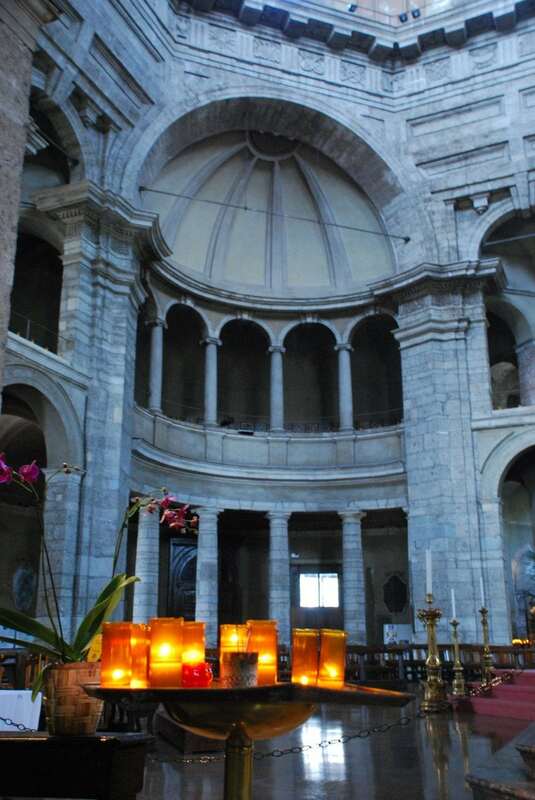 It was founded in the 4th century, and rebuilt in the 19th century. Sant’Eustorgio originally housed the relics of the Three Kings, which were later subtracted and taken to Cologne by Frederick Barbarossa. 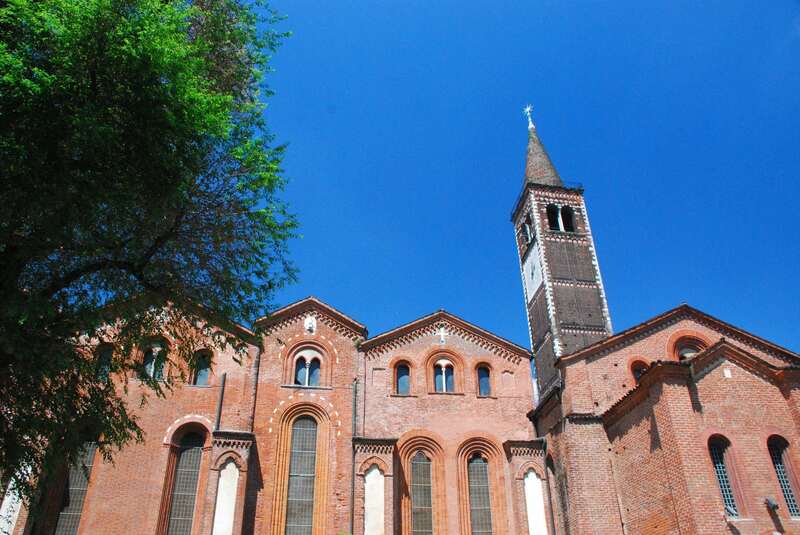 However, from the 13th century on, the church took on an important role, becoming the principal location for the Dominican Order in Milan from 1227. 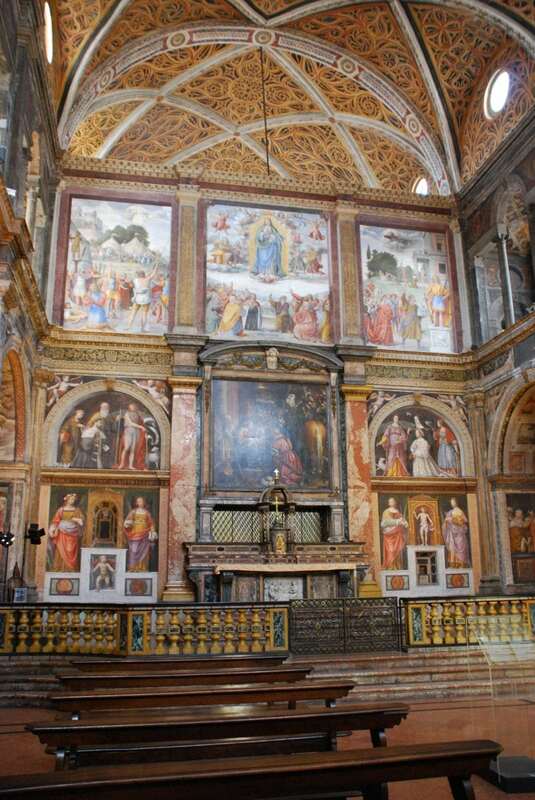 Two of the several chapels are particularly significant: the Brivio Chapel, dating to 1484, with a Renaissance tomb and a triptych by Bergognone; and the Portinari Chapel, built from 1462 on, commissioned by Pigello Portinari, and an example of Florentine art in Milan. 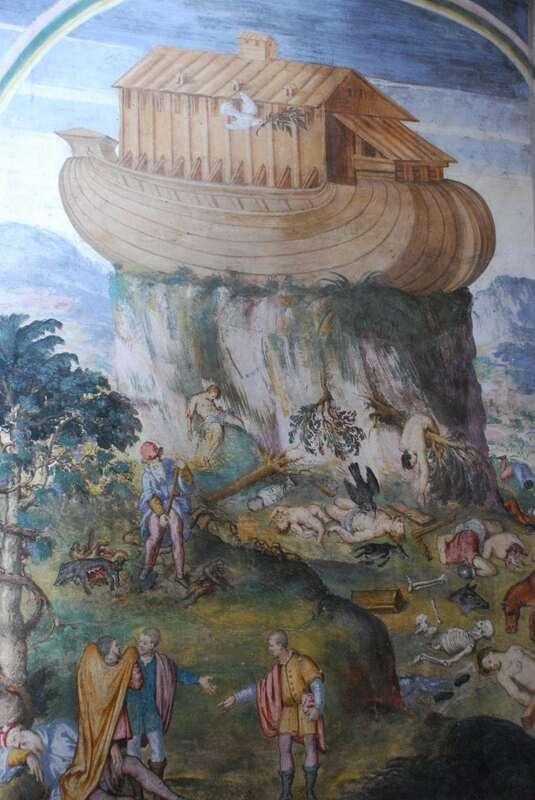 Inside, the upper sections of the walls were frescoed by Foppa between 1466 and 1468. 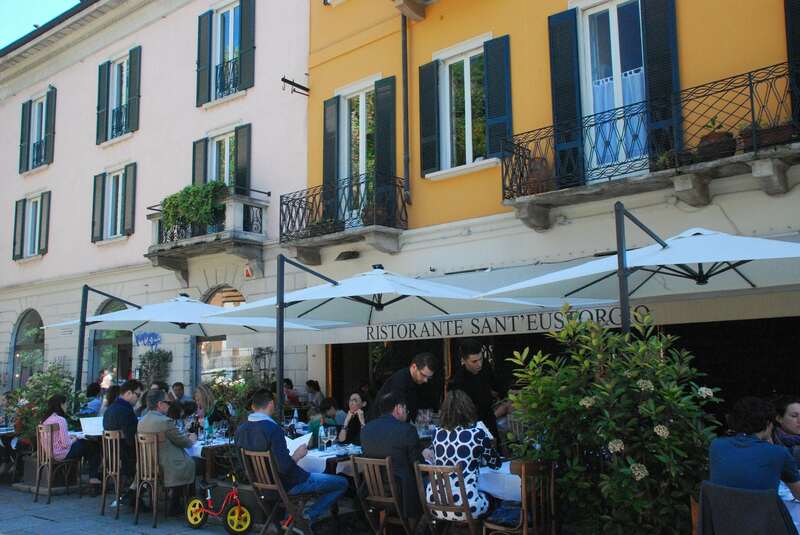 Now that your appetite for culture is satisfied, you may consider have something to eat in the excellent Ristorante San’Eustorgio , where you can ask for a table with a view on the square and the church. 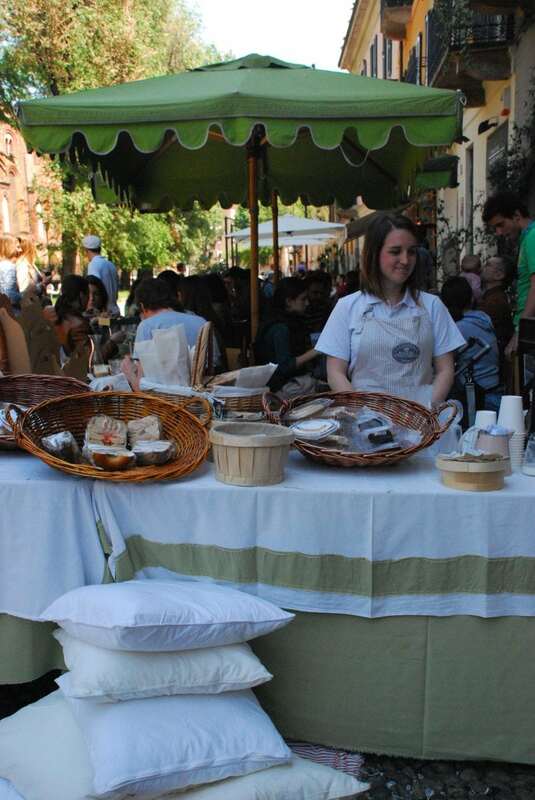 Alternatively, if you ar efed up with pasta and keep on dreaming about yankee food, popular California Bakery, just alongside Sant’Eustorgio, is what you are looking for. 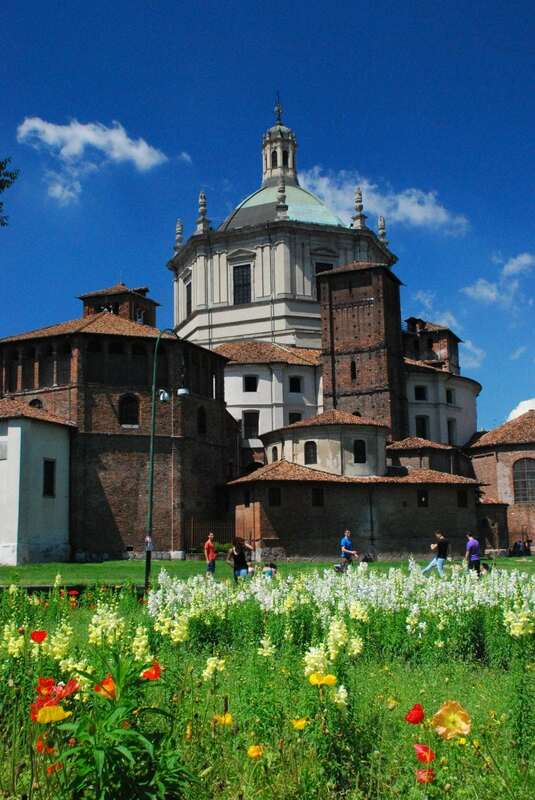 Enjoy your walking tour in Milan! Thanks a lot for liking my Blog. Stay tuned for next post “walking tour in Capri”! Thnaks for your comnet, John. I’m sure you will enjoy your visit in October. Are you going also to the Expo?